First quarter of my online business has ended. If I evaluate it, then It has been a pretty slow start to my business. I am designing and selling products on the websites like freecultr & postergully. And these websites (Freecultr & PosterGully) are already competing with the shopping websites like flipkart, snapdeal, myntra, jabong & amazon. Moreover freecultr and postergully are brands and as brands, they are competing with the brands like Puma, Nike, adidas, UCB, Reebok, USPA etc. This is the competition on bigger level. If I talk about internal competition, then there are more than 13000 designers on freecultr and some 4000 designers on postergully. Considering the competition and my qualification in designing and art, I should be grateful that atleast I have got a start but there are lot of fellow designers whose qualification in art and design is similar to me. Most of them are performing much better than me. If they can do it then why can't I? I am a Marketing gradute and considering my earnings of first quarter, I must say that I have failed as a marketer and I accept this brutal defeat gracefully. I begin my second quarter this month and hopefully I will grow my business in this quarter. Along with the second quarter, the season of cricket has also begun. So this month, I have designed the products keeping #WT20 in mind. Big brands and designers come out with winter collection or summer collection but here I present The #WT20 collection. 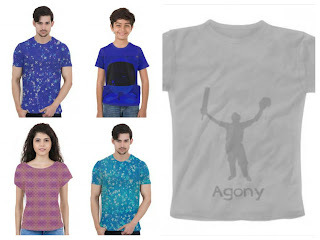 I have put five designs on freecultr this month and only one of them is on cricket. Three out of five designs are in blue shade because two of them are the older ones. I have made changes in them. Remember the two tictactoe tees in my collection? I have made changes in them. Earlier X and Os were spreaded on 75% of the tee but now they are spreaded all over the tee. Third tee in blue is an illustration which shows that a spaceship has just landed on the planet. Apart from them there is one pink tee on which I have applied texture. From the first time I have played with texture. I hope it has come out well. Fifth one is designed keeping t20 cricket in mind. T20 cricket is all about aggression and the aggression ends with agony. Thus fifth tee is expressing agony in grey shade. Now the important notice. You can buy these designer tees for children as well. Earlier tees on freecultr were only for men & women but now they have started producing same for children ageing 5 to 14. On postergully, I have played with #WT20's logo, have made my own logo and have picked some players who are going to make an impact in #WT20. I have designed many products around these three things. Actually it is the variety of products which completes my #WT20 collection. In clothing there are Men's tees Women's tees and unisex tank tops. You would have seen lot of tees with variety of players on it but I bet you these tops are different. This collection is more vibrant amd colourful. I have made two variants of most of the designs in this collection and it just adds few more colours to the collection. You want to know which players I have chosen? Well, see them in the pic below. In tech stuff, there are mobile cases, mousepads & laptop skins. In this there are no two variants or something but they will make your gadget look awesome. And it is not like that it is made only for #WT20. Most of them is designed in such a way that it will look good on your gadget even after #WT20. In this there are posters, premium glass frames, wall clocks, cushion covers, coffee mugs, accessory boxes, coasters, notebooks etc. and these products completes my collection. If you are a cricketmaniac then you can decor your whole house or your room from this collection. I am working on this collection since february. I had lot of ideas but either they were not clicking or they were not coming out the way I wanted. As it is a collection made on the theme of cricket, I needed players names, logos, flags, sketches etc but there were lot of copyright issues around them. Thus it was the most challenging collection for me as a designer. I was about to launch it in the first week of March but I was not satisfied with it. So I worked on it for few more days and finally it came out the way I wanted. It is not that this collection is only made for #WT20. I have named it #WT20 collection only because I am launching it at the time of #WT20. Most of the designs in this collection will look classy always. Whether it is mugs, t-shirts, laptop skins or anything. You can freely express your adulation for the players or the game with this collection. So explore it and start flaunting your love for the game.